Being informed about bed bugs and treatment options in advance, will help you select the best pest control company for your infestation. Choosing the wrong company can mean an extended infestation and wasted money. You want to know what pesticides they will use and what the residual is, or how long will it last and keep killing bed bugs. In Oregon, (check your state) Pest Control Operators must pass licensing tests for specific pesticides. They must be trained and licensed for each pesticide they handle. Many companies do not enforce this or they use the owners license. This is illegal. You want your pest operator to have a professional working knowledge of each chemical they are using in your home. As a consumer you are entitled to ask which pesticides they are licensed to use. This is why some “green pest companies” are green. Because they are not licensed to use real pesticides against bed bugs. I would not hire a company that will not explain in detail what they are going to treat, how and where. If they don’t want to answer your questions that should be a huge red flag. Keep in mind you are investing some cash and trust in these people. In fact getting rid of your bed bugs will be mostly in their hands. If they won’t reveal their methods, find another company who will. Spending less money on a bad company means you’ll be spending more money on a good company later and with even more bed bugs in your home. Don’t waste precious time or money on bad pest companies. There are good pest control companies and not so good, or outright horrible and worthless. One company I had over for an interview instructed me to remove my mattress encasements because they couldn’t find any bed bugs during their inspection. Of course I refused. Taking the time to interview several will help you to choose the best one. If they don’t call you back, let that be a flag. If they don’t find bed bugs during the inspection, let that also be a concern. Do they charge for an inspection? Do they require a specimen to treat your home? Most ethical companies will not treat without finding a bed bug or you showing them one. How long will the pesticides last? Will they put pesticides or powders inside the walls or on furniture? Do they offer a dog that can sniff out bed bugs and pinpoint their location? How should you prepare in advance for treatment? What should you do about your pets? What if your couch or chairs are also infested? Are mattress covers included in the cost of their service? Should you avoid mopping or vacuuming in the areas after they treat? Should you isolate your bed now or later? How will you ensure you do not re-infest your home or car? How can you treat personal items that could be infested? You have to operate under the assumption that everything could be infested, even if you’re pretty confident it’s not. Every single thing you own that’s in your living space or you’ve had contact with must be inspected or treated. See DIY Treatment for more information about how you can treat personal possessions, like pillows, toys, files, papers, electronics. If you follow these protocols your chance of success goes up dramatically. Don’t start sleeping anywhere but your bed or your infestation will spread. Take charge of your infestation! You do have the biggest influence as to whether your treatment will be successful. How you treat your possessions, where you sleep, moving infested items around your house, not taking precautions or following preparation protocols or post-treatment recommendations can affect whether your treatment will be effective or not. Learn more about what’s entailed in chemical treatment here, and heat treatment here. Coming in and spraying pesticides in your home is only one part of the treatment. Without all the parts: pesticides, preparation, and protocols, you will not succeed. I know you want to succeed, to kill all the bed bugs. I did it, I got rid of all the bed bugs and so can you. I’m here to help. Choosing the right company is so important for many reasons. You may be spending money to get treatment and if they fail you, not only will that money be wasted, but your infestation may continue growing the whole time. This is why being informed is so critical when you are making big decisions. Keep in mind if they don’t do a good job, you are not going to be able to prove it because you have bed bugs and getting rid of them is so dependent on your personal behavior. Even if you are 100% perfect about preparation and behavior, the pest company can argue you are at fault for still having bed bugs. Questions, use the contact form. Some companies do not charge for inspection, but many do. Ask if the fee will be applied toward the work, if you select them. It is helpful If you have a specimen at the time of the interview, however you want to see the PCO inspect and find bed bugs on their own. This is an excellent video which you can also access at http://www.monkeysee.com/play/27911-how-to-choose-a-bed-bug-professional. Always deal with a qualified and licensed pest management company. Consider asking to see the license or other credentials of the pest management professional that comes to solve your pest problem. 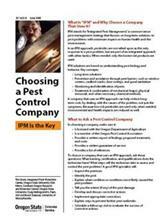 Evaluate pest control companies that are members of national, state or local pest management associations as they have access to up-to-date information and education. For bed bug service work, work with companies who have experience in dealing with this challenging pest. Consider an NPMA QualityPro company. Visit www.npmaqualitypro.com for more information. Ask friends and neighbors to recommend pest control companies they have used successfully and how satisfied they were with the service. If a sizable amount of money is involved, get bids from several pest management companies. Don’t rush a decision. Since you are paying for professional knowledge a well as skillful application of pesticides, look for someone whose judgment you can trust. Before signing a contract, be sure to fully understand the nature of the work to be performed, the extent of the infestation and what is covered by the service agreement. Buy value, not price. Beware of professionals that offer bargains that sound too good to be true. Homeowners can call state pest control regulatory agencies for information regarding the status of pest management companies. In most states the regulatory agency is the State Department of Agriculture.